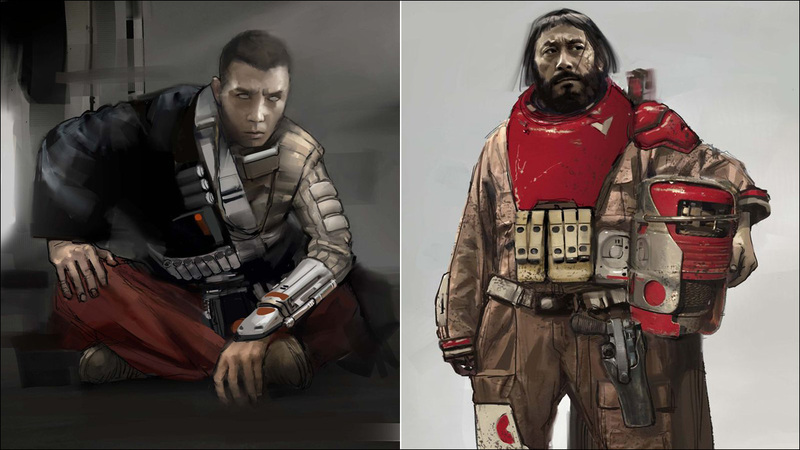 'The Art of Rogue One' reveals concept art that shaped these fan-favorite Star Wars characters. 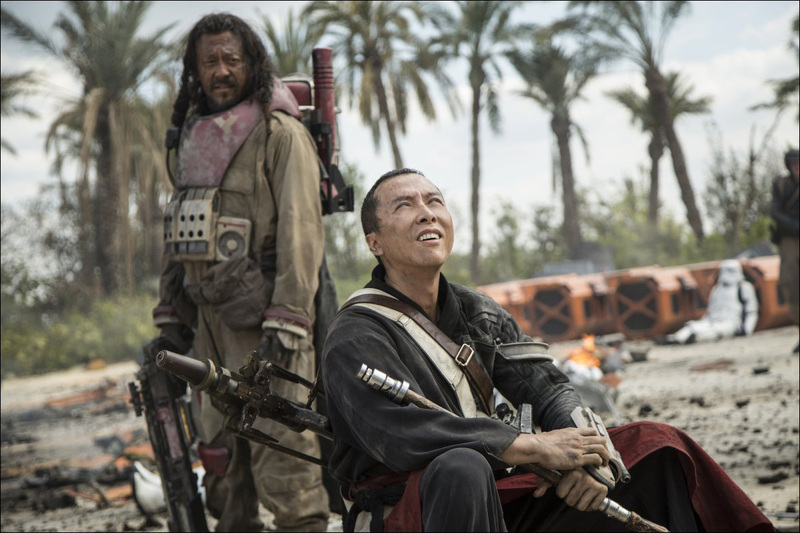 Chirrut Imwe and Baze Malbus have quickly emerged as fan favorite characters from Rogue One: A Star Wars Story. 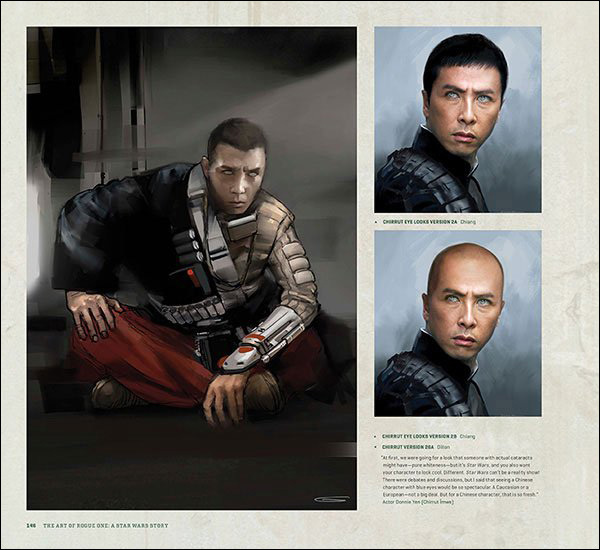 But the movie's early concept art, featured in the official book The Art of Rogue One, reveal that it took quite a bit of work to settle upon the right looks that were eventually realized for Rebellion's Force-friendly blind monk and his battle-weary compatriot, played by Donnie Yen and Jiang Wen, respectively. 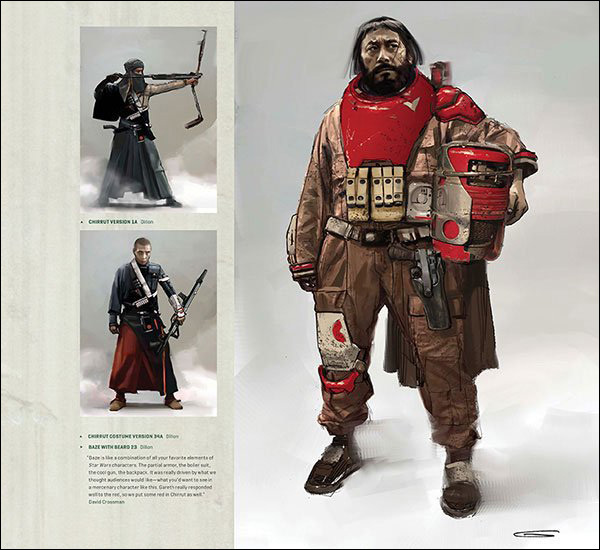 Both Chirrut and Baze went through 25-35 different looks from the characters' early conception to the final versions that were eventually committed to the screen. 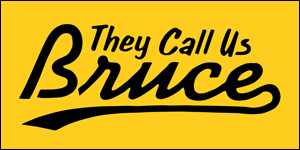 Initially, according to comicbook.com, Chirrut was entirely covered except for his eyes, and Baze may have been a four-armed alien. Chirrut had a more militaristic vibe before the character's look morphed into a sleeker, martial arts-inspired monk's garment. Donnie Yen apparently had some input regarding the eerie tint of Chirrut's eyes. "At first, we were going for a look that someone with actual cataracts might have -- pure whiteness -- but it's Star Wars, and you also want your character to look cool. Different. Star Wars can't be a reality show!" says Yen. "There were debates and discussions, but I said that seeing a Chinese character with blue eyes would be so spectacular. A Caucasian or a European -- not a big deal. But for a Chinese character, that is so fresh." Baze, rendered here with slightly shorter hair and a fuller beard, was apparently conceived as an amalgam of some of your favorite Star Wars character elements. "Baze is like a combination of all your favorite elements of Star Wars characters. The partial armor, the boiler suit, the cool gun, the backpack," says costume designer David Crossman. "It was really driven by what we thought audiences would like -- what you'd want to see in a mercenary character like this. [Director] Gareth [Edwards] really responded well to the red, so we put some red in Chirrut as well." Rogue One: A Star Wars Story, directed by Gareth Edwards, with production design by Doug Chiang and Neil Lamont, is currently in theaters. The Art of Rogue One: A Star Wars Story is available from Abrams Books.